This is the story of how The Lone Ranger and his legendary horse “Silver” first met. 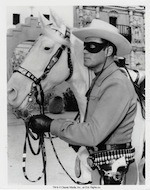 This entry was posted in Radio Yesterday Podcast and tagged Adventure, The Lone Ranger, Western. Bookmark the permalink.